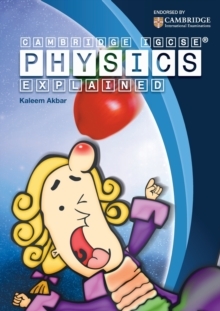 Cambridge IGCSE Physics Explained is a comprehensive summary revision book aimed at 14-16 year old students. This book is designed to cover all of the learning outcomes for the Cambridge IGCSE Physics (0625) syllabus for examinations from 2016 onwards. This books layout was designed by students, it contains clearly illustrated diagrams, step by step calculations and valuable additional support materials such as a complete formulae summary and glossary of important terms. All core and extended material is clearly highlighted and as a whole helps to guide the learner. The font size is large and the text is well spaced out and easy on the eye.